They are synonymous with French haute cuisine, but the cultivation of truffles in Australia has proved such a success that the first batch has been exported abroad. This has brought a touch of Provence to upland regions of south-eastern Australia, where conditions most closely resemble those of Europe's best-known truffle-growing area. It is a perfect winter's day and ideal for a truffle hunt. The sun is shining, the sky is a deep blue and the hazel and oak trees are rustling gently in the breeze. But this is not Provence or Perigord. Instead I am in the Southern Highlands of New South Wales, just two hours' drive from Sydney. The hills and ridges are covered not with deciduous forest but with gum trees and wattle bushes. The business has been pioneered by Duncan Garvey, a former agricultural economist who has flown in from his home in Tasmania to meet me here in the hills. Duncan hauls some battered boots and waterproof trousers from the back of his car and we set off, weaving between the oak and hazel saplings and hoping Pickles will pick up a scent. Duncan encourages his dog in a soft voice: "Find truffles, Pickles, find truffles." Pickles bounds around the hillside, giddy with excitement after spending hours in a crate during the flight from Hobart. Ten minutes into the truffle hunt and she appears to be having a bad day. She stops beside a wispy hazel bush. Duncan kneels down and digs away at the soil with a knife and his fingers. But it is a false alarm - the dark earth reveals nothing more than stones and bits of wood. The search resumes. The plantation around which we are walking is the property of husband and wife team Bill and Pat deCorsie. They knew nothing about truffles or truffle growing when they established it five years ago. Despite the fact that the 500 trees are barely waist-high, they have already started producing truffles. This is the deCorsie's first harvest and so far they have gathered around six kilograms of the black treasure. That does not sound much until you learn that a kilo of good quality truffles sells for USD $2,300. There are peculiar challenges to cultivating truffles Down Under. "The bloody wombats were getting in over the fence," Bill tells me. "We had no idea they could climb." Installing an electric wire has solved that problem, but it is still no deterrent to the local kangaroos, which simply hop over. But at least they cannot get at the truffles, which grow on roots just beneath the ground. The saplings are infected with the tuber melanosporum fungus, which is specially imported from France, and then planted in chalky soil. The whole process is a gamble, as Bill cheerfully admits, but it is one which is evidently paying off. Earlier this month, a small consignment of truffles was sent to a gourmet restaurant in Tokyo. It was the first time that Australian truffles had been exported abroad. Whether the Antipodean product will meet the high standards set by the French remains to be seen. 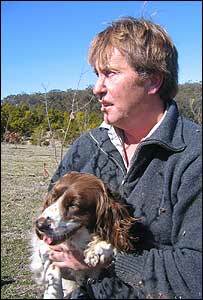 The long-term plan, Duncan says, is to export truffles to Europe, Asia and North America - anywhere, in fact, where there is an out-of-season demand for the aromatic fungi. The size of the Australian harvest - about 80 kilograms is likely to be produced this year - is dwarfed by France's annual haul of eight to 10 tons. But with almost limitless space, good soil and technical savvy, the potential for growth is enormous. Pickles is now pawing at the base of a small oak tree. Duncan scrabbles around in the dirt and encourages me to get down on all fours. "Smell that," he says, nose pressed to the ground. "Isn't that a magnificent perfume?" To be honest all I can smell is dirt. I am also suddenly aware that wearing a pair of cream trousers is not the ideal attire for a truffle hunt. I stand up and have two big muddy rosettes on my knees. After a few minutes digging, Duncan reveals an absolute monster of a truffle. It is the size of a potato. Pickles has redeemed herself, Bill and Pat are delighted and I get to see my first ever fresh truffle. If the French are not quaking in their espadrilles yet, then maybe they should be. From Our Own Correspondent was broadcast on Saturday 26 August, 2006 at 1130 BST on BBC Radio 4. Please check the programme schedules for World Service transmission times.